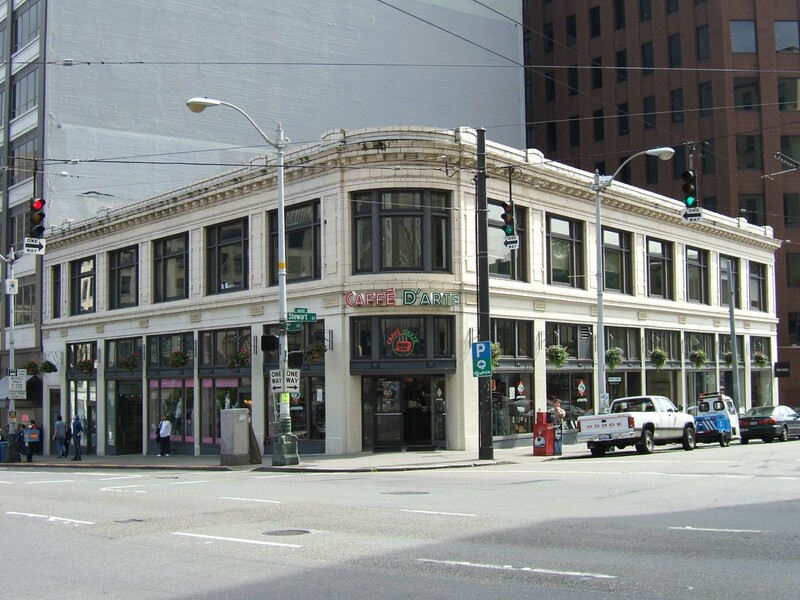 Located at the SW corner of Second Avenue and Stewart Street, this two-story commercial block was designed and constructed to house retail and commercial tenants and a small business college. It continues to be used for retail and commercial office purposes. The building is a trapezoidal shape due to its adjacency to Stewart Street, which runs at an angle to the principal layout and street grid pattern of the commercial core to the south. It measures 95’ at Second Avenue, 113’ at Stewart Street, 62’ at the alley side and 108’ at the adjacent building/southern property line. It exhibits a two-part commercial block façade composition and is distinguished by exterior design elements in the Classical design mode. The masonry and concrete structure includes a foundation and basement and is entirely clad with cream-color terra cotta at the two primary facades and common brick at the alley elevation. The facades are divided into six bays at Stewart Street and five bays at Second Avenue and a prominent rounded entry bay is oriented toward the street intersection. A narrow secondary entry bay is located at the south end of the Second Avenue elevation. The primary facades are distinguished by terra cotta cladding at the storefront level piers, decorated terra cotta pilasters between the upper floor level window openings, and a continuous projecting terra cotta cornice with denticulated trim and articulated parapet wall. Along the 2nd floor line are a series of small decorative terra cotta panels that correspond with the pilasters above. This decorative band is surmounted by a narrow intermediate cornice. This element in conjunction with the curved cornice further accentuates the trapezoidal building form and the prominence of the building entry element. Large rectangular storefront bays remain entirely intact and include tripartite and multi-pane window transoms that are the same or very similar in design/character to those recorded in 1937. The display windows and bulkheads may be more modern replacements but are in character with the historic design. The second floor level windows are large framed Chicago type windows with operable side panels and include distinctive curved and glazed members at the rounded corner above the recessed entry vestibule. All of these windows appear to be original or consistent with the original design. The alley elevation windows are double-hung type with divided 2/2 and 3/3 lights individually set within the plain masonry wall. There have been very few alterations made to the exterior of the building, which remains in good condition. The secondary entry appears to have been remodeled and modernized with some terra cotta ornament removed. There do not appear to be any intact or architecturally significant interior building features, finishes or public spaces. Boyle, Susan. "121 Stewart Street Building" - Landmark Nomination, submitted January 2004.